Alan Yellup was chief executive. A chain of academy schools is looking for a new boss after the departure of its £160,000-a-year chief executive. Wakefield City Academies Trust (WCAT) has confirmed Alan Yellup is no longer in charge of the organisation. He had not been running the trust since March, when he went on “personal leave”. WCAT runs 20 schools, including Wakefield City, Freeston and Hemsworth academies. Since March its former chairman Mike Ramsay has been acting as interim chief executive on a rate of £395 per day. WCAT said this was “much reduced” from the average daily rate of £964 for a chief executive. Mr Ramsay will remain in the interim role until next July while a permanent replacement is sought. He said in a statement: “There is much work to be done and I’m looking forward to continuing in the role. 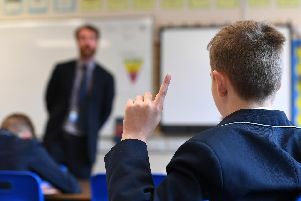 “The trust, over the last two years, has agreed to take on academies in some of the Yorkshire region’s most challenged communities. “While some are already demonstrating good practice, turning a school around cannot be done overnight. Trust bosses agreed to appoint a permanent replacement for Mr Yellup at a board meeting on July 9. Mr Yellup, who was awarded the OBE in 2014, has since set up Alan Yellup Consultancy Ltd, incorporated on August 22. The firm has its registered office in Workington, Cumbria, and describes the nature of its business as “educational support services”.